While the questions regarding the Giants final 25-man roster have mostly been limited to backup catcher (Chris Stewart has a .907 OPS in 26 Spring Training PAs!) and long relief (Dan Runzler has a 2.77 ERA and a 6.0 K:BB ratio in 13 IP! ), the main “controversy” has revolved around Brandon Belt, the hard-hitting prospect. 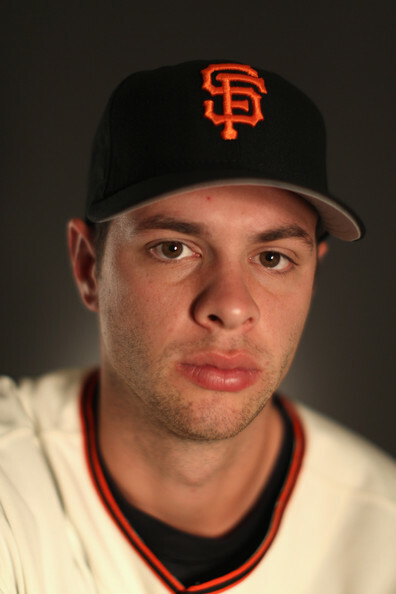 Belt, a 22-year-old lefty first baseman from Texas, was drafted by the Giants in the 5th round of the 2009 draft. In 2010, his first year of pro ball, he was promoted quickly: he played just 77 games in Single-A, 46 games in AA, and finished the year playing AAA ball in Fresno. Across the three levels he had an extraordinary slash line of .352/.455/.620 with 23 HR. While these numbers should certainly be taken with a grain of salt, considering that they combine three sets of stats from extremely different leagues, they’re certainly impressive. So the question is: what should happen to him in 2011? Bruce Bochy has stated that he wants Belt to be a starting player, wherever he is, which means that they won’t bring him up to the majors just to sit on the bench. Clearly we want Aubrey Huff to play everyday too, however, which means that any configuration that includes Huff means that our defensive positioning will look a little wacky. As I see it, here are some potential scenarios. Scenario A: Burrell slumps/gets injured. Huff moves to LF, Burrell moves to the bench, Belt in at 1B. While everyone has been talking about Belt “hitting his way onto the team,” the truth is that somebody also needs to slump their way off the team as well. One major unknown is Pat Burrell, who found new life on the Giants after slumping his way off the Rays. He had an abysmal World Series, but he’s hitting .238/.347/.452 in Spring Training with 2 HR. This kind of slash line (low AVG, but good OBP and SLG) is what we’ve come to expect from Burrell, and will probably be good enough for him to keep the starting job in left field. Belt is also hitting .264/.316/.472 with 2 HR, which is pretty damn close to Burrell’s spring. As far as I’m concerned, Belt should show us something significantly better than Burrell before he gets the job. Belt would also face competition from Mark DeRosa, who would probably be the default backup for Burrell. DeRosa, as long as he can stay healthy again, has seen a decent resurgence in his offense production this spring, hitting .306/.342/.417 with one HR. He clearly does not have the power that Burrell has, but if he can hit for average and get on base at a good rate, he’s still valuable. If Belt comes up to be our starting first baseman, we’d also probably see the team drop a player to make room, with the most likely target being Travis Ishikawa. Ishi, a first baseman on a team that suddenly finds itself with three first basemen, would then probably either be cut or traded at a bargain, given Ishi’s zero remaining minor league options. To his credit, he fully realizes this, and has said kind words about the organization even in the face of his potential dismissal. Scenario B: Ross slumps/gets injured. Huff moves to RF, Belt in at 1B. One of the great parts about Aubrey Huff is his versatility, both physically and emotionally, in that he can (and is willing) to play at a number of positions. This scenario basically mirrors the Burrell/DeRosa scenario, where Belt would have to make himself a better option than Cody Ross. With Ross’s recent calf strain this becomes a bit more likely, especially now that he’s somewhere between “likely” and “certain” to start the year on the DL, but I’m not going to make any grand statements until we have a bit of a better idea of Ross’s injury. Ross has been one of the Giants’ better hitters in Spring Training, batting .295/.367/.591 with 3 HR. If he can keep that up in the season, I think it’s safe to say that he’ll keep the starting job. Also, as much as I love Huff, AT&T Park’s right field is about as treacherous as an outfield can get, and I’m not sure Huff would really thrive there defensively across a full season. DeRosa, as the super utility man, could also make an appearance here. He hasn’t played much RF in his career, and very little at all since 2006, but he plays 5 other positions, so why the hell not? Nate Schierholtz is also an option, and he’s regarded as the most comfortable and skilled of all Giants outfielders in right field. He’s never been able to hit consistently enough to keep the starting role, unfortunately, but if he can up his hitting a little bit, his defense would make him a pretty good starter if something happens to Cody. He’s batting .260/.288/.400 in Spring Training, which is pretty underwhelming, but it’s not terrible, so he remains an option. Bochy also used Nate extensively in 2010 as a late-inning defensive replacement for Pat Burrell, so if Huff ends up starting most games as an outfielder, it’s conceivable we’d see a lot of Nate next year given Huff’s limited range in AT&T’s cavernous right field. The other thing to consider involves Belt’s future contract, and the possibility of the club saving some clams in the years to come. The collective bargaining agreement for the MLB gives players certain privileges in their contract negotiations depending on their major league service time. A player with three or more years of service, but less than six years, may file for salary arbitration. In addition, a player can be classified as a “Super Two” and be eligible for arbitration with less than three years of service. A player with at least two but less than three years of Major League service shall be eligible for salary arbitration if he has accumulated at least 86 days of service during the immediately preceding season and he ranks in the top 17 percent in total service in the class of Players who have at least two but less than three years of Major League service, however accumulated, but with at least 86 days of service accumulated during the immediately preceding season. The way the contracts work is that players, even superstars, earn a pittance (by baseball standards) until they become eligible for salary arbitration. Therefore it’s in the club’s best interest to delay that as much as possible, while balancing their need to have the players on their team. The tricky part comes when a player has played more than two years in the majors, but less than three, because there’s a specific point at which you start rounding up instead of down, and if the manager can stay on the good side of that, it could potentially save millions of dollars by delaying a player’s salary arbitration by a year. On the other hand, they added in the 17 percent clause in the above rule to prevent managers from stopping their players just before the threshold and making it too easy; rather, there’s no way to know how many days the 17 percent will equal by the end, making it hard to estimate how much service time will qualify the player for arbitration after two years instead of three, aka a “Super Two” player. Very game theoretic, if you’re an econ nerd like me. What this means in the real world is that there is a certain date at which the Giants can bring up Brandon Belt in 2011 and not have it count as his first “full” season; the only problem is that they don’t know just when that date is until all of the other teams bring up their rookies as well. Complicated, but if Belt becomes a superstar and commands a multi-million dollar salary, especially if the same happens with Sandoval and Posey around the same time, we could end up paying through the nose to keep our young studs. If we can make it through the season without using Belt very much, it could pay off. In summary, anything could happen. My personal vote is to see Belt start the season in AAA Fresno. The Giants conceivably have a better lineup than they did last year, particularly if Panda bounces back, Ross stays Babe-like, and Burrell keeps mashing, so he may not be necessary. Belt’s promotion would probably mean losing either Nate or Ishikawa, both of whom would be missed, so here’s hoping. Also, if we can space out the development of our superstars, we might be able to afford to keep a couple more as they all becomes prohibitively expensive, so we won’t see a huge hangover period after this surge of talent. What do you think? Should Belt start the year in Fresno? In the majors? How do you see our defensive placement working out if he comes up? Comment your thoughts.